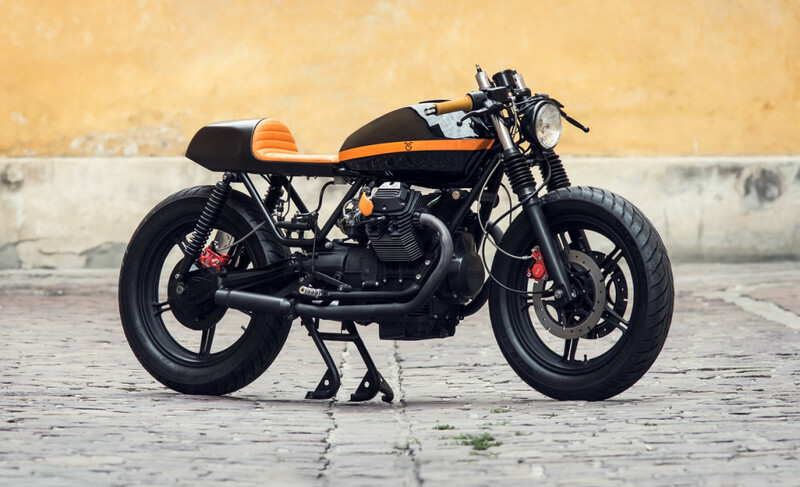 The Moto Guzzi V65 was introduced in 1982, an air-cooled 650 (643cc) twin in the typical Guzzi configuration. The bike was known for rock-solid stability at speed, and there’s an undeniable romance to an air-cooled Italian twin, especially one of this era. 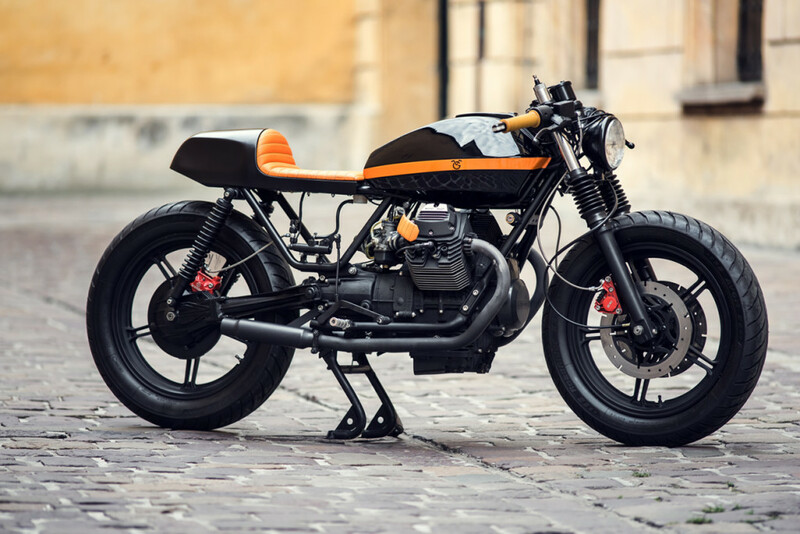 The guys at Poland’s Ventus Garage saw the potential in this oft-overlooked member of the Guzzi line. Below, we get the full story on the build. Ventus Garage is a group of brothers and best friends. Me, Paweł Guzik – designer, builder and responsible for all kind of media promotions and for Ventus Garage Apparel. Then there is my brother Maciek Guzik. My brother is a bike designer and builder who actually lives, builds, rides and spreads the good Ventus Garage vibe in Perth, Australia. Of course it’s not only us creating VG; there are plenty of contributors and good friends who helped, inspired and pushed us to keep on progressing in this semi-pro level. If you look to the past, to the beginning, there was a great passion that connected all of us – snowboarding. Many of us keep working together on a way to find freedom similar to shredding in fresh powder – we found exactly that freedom in creating bikes and riding them. 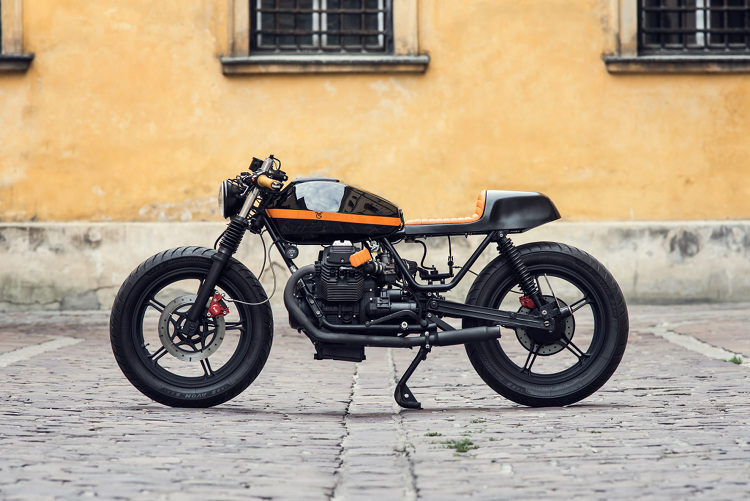 The bike is a 1994 Moto Guzzi V65 with 52 HP. 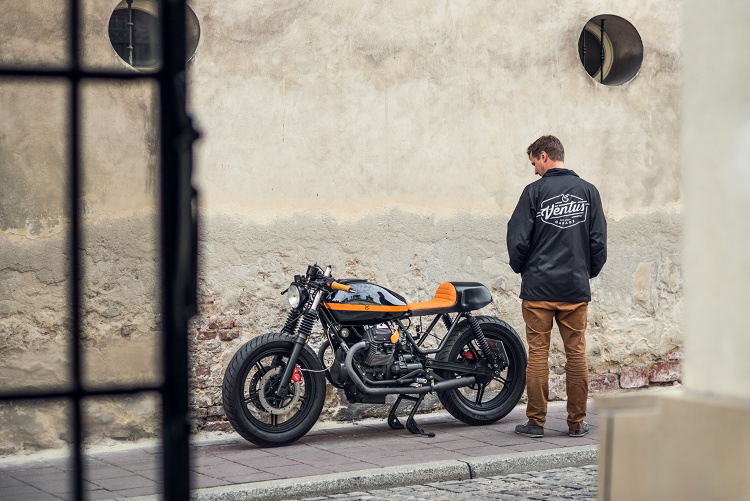 After few test rides we have decided to build this motorcycle in real cafe racer style. 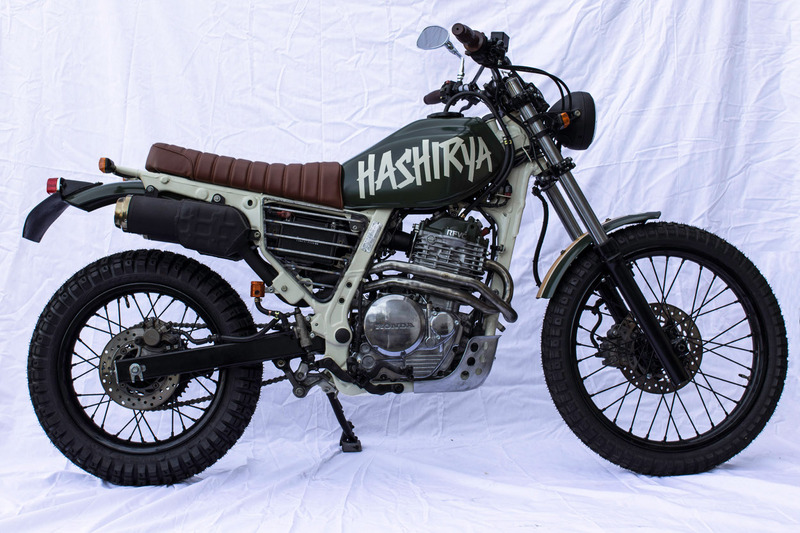 The bike was supposed to be glued down to the road, so we decided to lower the suspension and apply new, 6cm shorter and stiffer rear shocks, 10cm shorter springs in the front. That gave our machine a unique look and style. 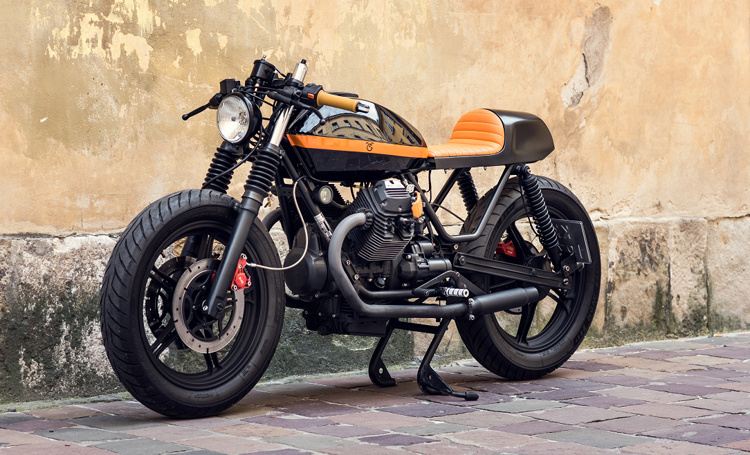 Original wheels have been replaced with 18-inchers from a Moto Guzzi V75 Police edition. This solution gave us bigger range of tires to choose from and which have the best performance, even in the sharpest turns. We end up with Avon AM26 Roadrider 110 / 90-18 tires in the front, and Avon AM26 Roadrider 120 / 90-18 in the back. Frame has been adjusted to fit cafe racer duck tail. 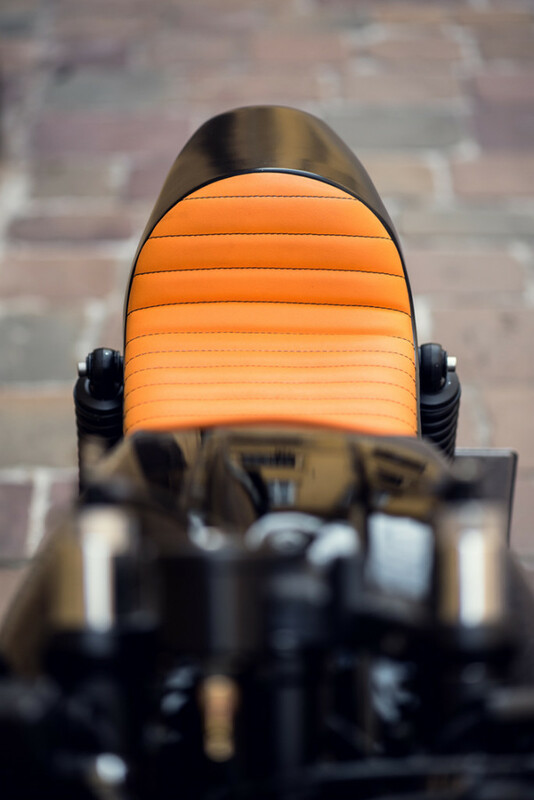 Seat designed by us is made from orange waterproof synthetic material. New stainless steel braided lines were used for the better braking. In Brembo calipers we changed brake pads to more efficient and changed brake fluid. Calipers were painted red to give a bit of character to our machine. The engine was painted with VHT structural paint that is resistant to high temperature. We replaced oil and filter, changed spark plug caps with terminals for NGK as well as spark plugs for the same company. After cleaning carburetors we changed the jets to bigger ones and installed the pod filters so that Guzzi properly responds to the throttle. 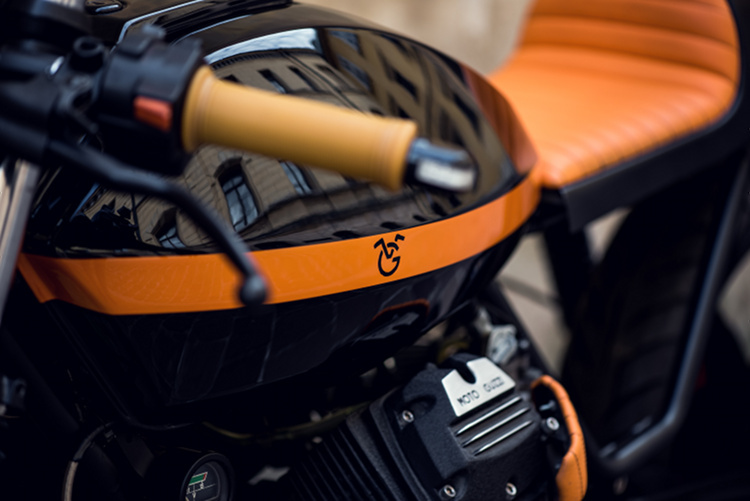 Fuel tank has been painted in glossy black with an orange stripe and finished with VG logotype. 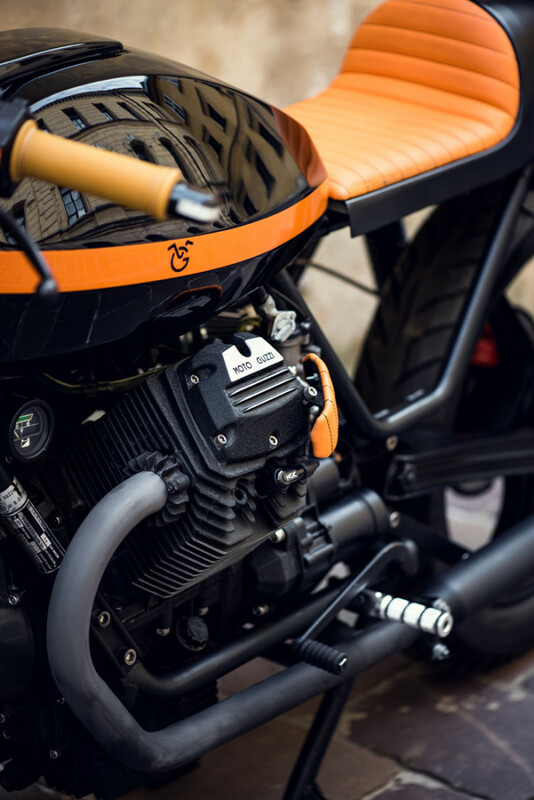 Clip-on handlebars made by Ventus Garage by our own design gave the bike a classic cafe racer look. By this treatment rider has a comfortable position behind the bars and perfect feel of it thanks to Biltwell Kung Fu Natural grips. Exhaust system ends with no baffle mufflers which gives an unearthly sound of V-type two cylinder. Lighting contains black Classic Bates 5 3/4 inch headlight, black old school taillight and turn signals in the handlebars. Whole electrical installation with gel accumulator has been hidden in the duck tail. 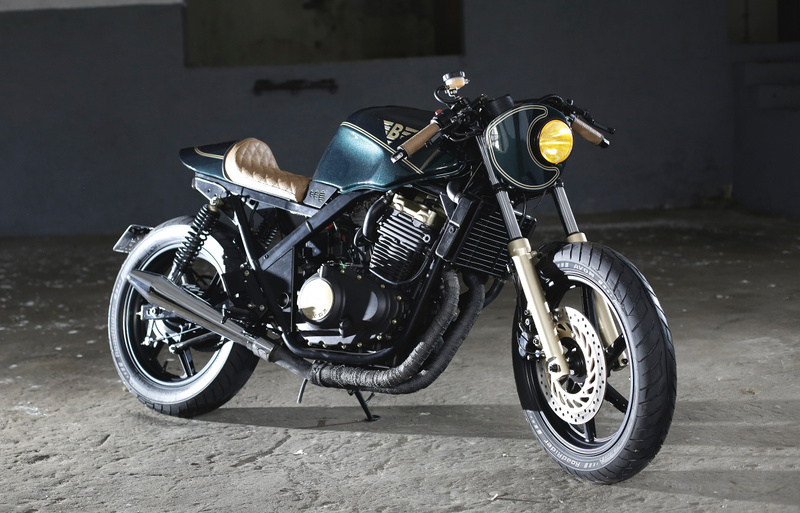 Note: this bike has also been featured on Bike EXIF and Silodrome.